While leaders meeting recently in Loveland considered last year’s general assembly a failure and even a disaster, they could at least take solace knowing they made headway in getting their concerns heard. A nationally publicized secession campaign in northeastern Colorado gained enough traction to help unseat two prominent Democratic legislators and forced a third to resign in order to keep the seat under Democratic control. National media has tended to portray gun legislation as the biggest source of the rift. Clearly, gun control laws are unpopular among farmers, many of whom hunt or live in remote areas where local law enforcement is hindered from responding quickly to security concerns. But ag leaders who met in mid-December seemed to indicate that House Bill 252, mandating the state get 20 percent of its energy from renewable sources by 2020, had driven the deepest wedge. Rep. Lori Saine, a House ag committee member from the Fort Lupton area and one of several lawmakers who met with farmers during a legislative town hall event, described it as an “injustice” that would end up boosting electricity rates by 20 percent in rural areas while having little or no impact on Front Range utilities. Greg Brophy, of Wray, a state senator and Republican candidate for governor, advocated the repeal of 252, saying it needed to be eliminated before any money was sunk into meeting the new requirements. Among the bill’s criticisms is that it does not include hydropower as a renewable energy source. Hydropower makes up a significant portion of the energy portfolio for rural electric cooperatives, and hopes are widespread that further hydropower development can be piggybacked onto infrastructural improvements needed following the August floods. Others questioned whether the new bill would actually contribute to a cleaner environment. Rep. Fischer, a Democrat from Fort Collins, is chairman of the House ag committee. “My sense is agriculture is very well represented at the legislature, but it doesn’t necessarily translate into total agreement on all of these issues,” he said at one point. “I think it’s real, and I think it’s something the state needs to address,” he said during a panel wrap-up. His statements drew a compliment from Wray’s Brophy, who sits on the state’s Senate ag committee. “I’ve watched you really grow into your role as committee chairman,” Brophy said to Fischer, recalling how his House colleague went from sponsoring the infamous “tractor tax” targeting heavy equipment emissions in 2010 to backing important water conservation legislation this year to study groundwater management alternatives along the South Platte River. Let the dialogue begin about solving the problems of Colorado’s urban/rural political divide. Or not. 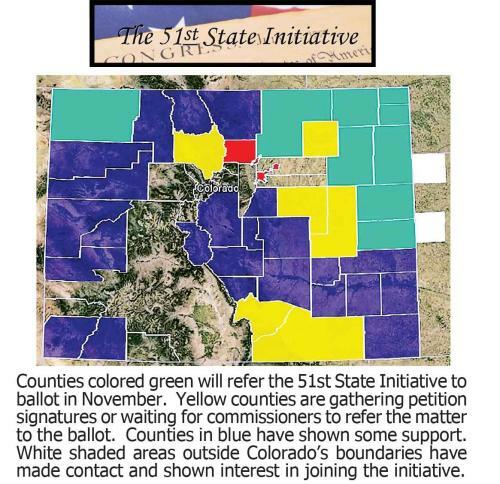 After the 51st state initiative failed in Weld County on Nov. 5 by 56 percent to 44 percent, Weld commissioners Sean Conway and Barbara Kirkmeyer said the effort to secede from Colorado started dialogue around the state regarding rural counties’ needs not being considered by lawmakers in the Denver-metro area. Colorado House Speaker Mark Ferrandino, D-Denver, though, has a different opinion. The big question now is: What can be done to get Colorado Gov. John Hickenlooper and the Democratic-dominated legislature to be more attentive to the concerns and needs of rural Colorado? “We understand that some rural areas still feel under-represented and are not being heard. We remain committed to listening more and working with local communities all across Colorado,” Gov. Hickenlooper said in an email response Friday. Eric Brown, director of communications for the governor, said Hickenlooper will continue to reach out to Weld County and other rural areas. Conway said the county commissioners began the journey in June with the recognition that the political divide exists, and it’s not going away. “I think we’re going to be at the Legislature in January looking for ways to do this. We’re going to be engaging with our state legislators who, quite frankly, have been AWOL,” Conway said. Even though 56 percent of the voters (more than 36,260) voted against the 51st state, Conway takes solace in the fact that 44 percent (28,107 yes votes) wanted a change. If you ask Conway, the political divide between rural and urban areas isn’t just about the Denver-metro lawmakers. Conway called out Rep. Dave Young, D-Greeley, as being part of the problem. In response to Conway’s comments, Young said he’s had numerous interactions with Conway. Young said his job is to represent the people in his district. Kirkmeyer said a positive thing that came out of the 51st state initiative was the Phillips County plan which would set representation throughout the state based on geography rather than population. The Phillips County plan would base either the state House or Senate representation on area instead of population, similar to Congress in which the House of Representatives is based on population, but the Senate has two senators from every state no matter the population. Ferrandino said it’s his understanding that based on a U.S. Supreme Court decision, the Phillips County plan would be unconstitutional. Ferrandino said there has been division in the state before, but not to the point of trying to form a new state. John Straayer, a political analyst and political science professor for 47 years at Colorado State University, said the Phillips County plan is a non-starter because of the Reynolds vs. Sims 1964 Supreme Court case that ruled that all districts in any state legislature must be equal in population. Young agrees there are some urban/rural issues to discuss, but he thinks most issues are more complicated than that. “I’m not sure I saw solutions being brought forward through the whole conversation on the 51st state, but we have issues around water that are of concern to everybody in the state,” Young said. “Agriculture uses 84 percent of our water, and they’re already claiming that there are impending shortages. If agriculture is affected, we’re all affected. It’s a complicated situation that we need to work together to resolve. Young agrees that some people don’t feel as if they have a voice at the table, which to him sounds like a communication problem. Ferrandino said there is a shift in population happening nationwide with more people moving to urban and suburban areas. Ferrandino believes it’s vital to have an open-door policy and listen to everyone. Straayer thinks the debate will continue between rural versus urban residents. Weld County voters decided against secession and the creation of a 51st state Tuesday, defeating the initiative 57 percent to 43 percent. Weld County Commissioner Sean Conway said he respects the decision of residents who voted down the 51st state initiative by double digits, but he said the dialogue regarding rural counties being heard has just begun. Weld County was one of 10 northeastern Colorado counties asking voters if they would like to secede from Colorado and form a new state. Moffat County, in northwest Colorado, joined the other 10 counties. After four community meetings around the county with Weld residents, the Weld commissioners chose to put the 51st proposal on the ballot and other communities followed. Weld County Commissioner Barbara Kirkmeyer said a lot of good work was done pursuing secession and the effort sent a message in just four months. Conway said the record turnout in an off-year election was wonderful. The complaints from the 11 counties came as a result of new gun regulations, proposed oil and gas legislation and a renewable energy bill for rural electric companies that commissioners said showed lawmakers in the Denver area weren’t listening to those in the rural counties. Kirkmeyer said the proposal kick-started the discussion that government is supposed to be about compromise, cooperation and communication. “If this turns things around and opens doors and people start working together more, I think all of that is a good thing,” Kirkmeyer said. Steve Mazurana, professor emeritus of political science at the University of Northern Colorado, spoke out against the measure at a 51st state forum. He said after the votes were counted that the people who want to remain in Colorado have spoken. Mazurana said county commissioners have job responsibilities, and there are things that they should be doing and things they shouldn’t be doing. Voters exiting the ballot drop-off site at the Windsor Community Recreation Center were mixed on the 51st state vote. Kim Larson of Eaton, who is a Colorado native, voted against the 51st state proposal. Jeff Dykstra of Windsor voted against the proposal, but saw both sides of the argument. For a motorist approaching Craig from the south on Colorado Highway 13 on a snowy October morning, Moffat County’s economic engines are well-displayed. Signs indicate the turnoffs to the Colowyo and Trapper coal mines. The towers of the Tri-State Generation and Transmission Craig Station coal-generated power plant loom just south of Craig. Pronghorn and mule deer — two prime targets of hunting in the county — share a field just before reaching the city. Mess with such industries, and you’re threatening the livelihood of communities like Craig, where many businesses sport signs saying, “Coal — It keeps our lights on.” It was local concern about perceived over-regulation of coal-fired power that led to Republican presidential candidate Mitt Romney visiting Craig during his campaign and presenting himself as a more coal-friendly alternative to President Barack Obama. Now that continuing concern is behind the county commissioners’ decision to ask voters whether Moffat should join counties in eastern Colorado in pursuing creation of a 51st state. “Energy is our economy. If energy goes away, we will be a ghost town,” said Moffat Commissioner John Kinkaid. The county’s list of top 10 taxpayers reads like a who’s-who of locally operating energy companies, with Tri-State alone accounting for nearly $6 million of the $17.4 million the 10 paid last year. Kinkaid first brought up the idea of secession to his fellow commissioners. “I was getting called by constituents here in our county asking for us to pursue it and so it didn’t really come from us as commissioners, it came from citizens contacting us,” Kinkaid said. “… It’s really a referendum on how the state Legislature has been running over rural Colorado. Many of us in Moffat County feel disenfranchised and that the Denver-Boulder power corridor is just running us over repeatedly,” Kinkaid said. For Kinkaid it started with the 2010 passage of legislation aimed at converting some Front Range Xcel Energy power plant generation from coal to cleaner-burning fuels such as natural gas. “We feel like we were just ignored over here and that it was a done deal before it was even introduced. “… They were buying their coal from us. That’s why we were so involved and concerned about what was going on,” he said. Then, this year the state Legislature passed a bill requiring rural energy cooperatives to obtain 20 percent of their power from renewable sources by 2020, up from a previous target of 10 percent. The requirement takes aim at Tri-State Generation and Transmission and is viewed by some as a threat to plants like the one near Craig. “They didn’t take really any input from Tri-State as to whether it was even feasible to do it,” said Kinkaid, who retired as a control room operator at the plant after winning election as a county commissioner last fall as an unaffiliated, but conservative, candidate. “And then throw in the gun legislation and I think that was the straw that broke the camel’s back,” Kinkaid said. That’s a reference to bills passed this year banning gun magazines with more than 15 rounds and requiring universal background checks before sales or transfers of guns. Said Moffat Commissioner Chuck Grobe, “They’re just passing laws that affect us and they don’t care what we say or what our feelings or thoughts are. While Grobe shares in that frustration, he voted against putting the secession question on the ballot, with Commissioner Tom Mathers siding with Kinkaid. “It’s not necessarily that I was against it. It was that there was no discussion beforehand. This just came out of the clear blue a week before it had to be on the ballot. There wasn’t any discussion with the city of Craig,” he said. He said Tri-State is concerned about water rights for its plant if secession happens, and he worries what the water implications for coal mines could be as well. As it turns out, the City Council of Craig, the county seat, voted unanimously against the secession idea, due to water and other worries. “We were completely against it because we don’t think it was thought out as far as the ramifications it could have,” said council member Joe Bird. He cited not just water but concerns about loss of state funding for highways, other infrastructure and schools. That said, Bird sympathizes with the motives behind the secession movement. “I understand them wanting to make a statement and their frustration and the Legislature not listening to them,” said Bird, who additionally said coal mines and the power plant provide jobs, a tax base and long-term stability for Craig. As far as making a statement goes, Moffat’s secession vote may indeed end up being more symbolic than anything else, as the obstacles against it are many, which Kinkaid acknowledged. “It’s sending a message, but we need to change the political calculus at the state Capitol,” he said. Moffat’s problems are compounded by the fact that it’s not contiguous with the eastern Colorado counties also talking about secession. And Kinkaid concedes the chances are slim of counties between Moffat and the eastern counties pursuing secession as well. Some of those counties hold political views distinctly different from Moffat’s. Other options include trying to join Wyoming or Utah. Renny MacKay, a spokesman for Wyoming Gov. Matt Mead, has been quoted in the media as saying Moffat’s secession discussion “does not move us forward” at a time when the country and Wyoming face significant challenges. “I guess they’re not interested in Baja Wyoming,” Kinkaid said with a grin. Views vary widely in the Craig area about the secession idea. “That’s the stupidest thing I ever heard. We have a perfectly good state. What are we messing around for?” said Ellen Johnson. But Van Piland said he voted for the measure. “I think most of the people in northwest Colorado would like to have more appropriate representation in Denver or else go to Wyoming,” he said. Amy Updike said that while it doesn’t necessarily mean she supports secession, she voted in support of at least looking into it. “Why not? The governor (John Hickenlooper) is not looking out for communities like ours,” she said. Maurits De Blank, who lives in Miami but runs apartments in Craig, said the proposal “makes no sense” and just reflects local frustrations with Denver. “There’s just no chance whatsoever in my view” that secession would occur, said De Blank, who shares in the desire to protect Craig’s coal-based economy. Garfield County Commissioner John Martin said Garfield commissioners haven’t considered the secession idea, but understand Moffat’s frustration. “A lot of people see a war against rural Colorado from the Front Range and that’s what’s really stirring it up,” he said. Garfield Commissioner Mike Samson is chairman of Associated Governments of Northwest Colorado, which includes Garfield, Mesa, Routt, Moffat and Rio Blanco counties. He said he thinks everyone in the association is sympathetic to the 51st-state cause. He doesn’t think the secession idea has much chance of succeeding, but hopes Front Range lawmakers will show more consideration for northwest Colorado, a big source of state revenue thanks to its natural resources. “I feel like we’ve been ignored in a lot of instances,” he said.